All toys are not created equal. Meet Tuffy. The world’s “Tuff”est soft dog toy. 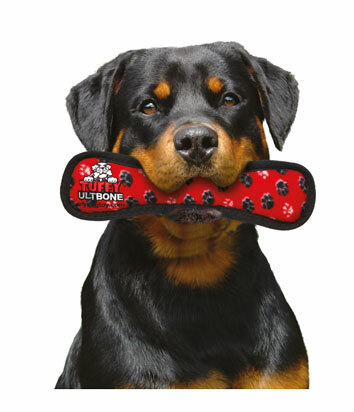 Tuffy pet toys – now available in South Africa – are the most durable dog toys available. With up to 4 layers of material and up to 7 rows of stitching, the various layers of the toys are sewn together to make one “Tuff” layer and are assembled with multiple seams for maximum durability. Each toy is stuffed with safe, non-toxic fibre with an extra protective pouch around each squeaker as an added safety measure, in the unlikely event that your dog gets to the core. Whether you have a gentle Pug or boisterous Staffie, the Tuffy Tuffscale enables you to choose the right toy for your dog. It was designed to give insight on how tuff the toy you’re buying compares against another. A 5 rating is where other toys end and Tuffy’s begin. If your dog is a notorious toy destroyer, choose a mega tuff toy which rates 10 on the Tuffscale. Look for the Tuffscale logos when you shop to identify the most appropriate toy for your dog. Tuffy toys are intended for interactive play or training between you and your dog. While they are extremely durable, they are also gentle on your dog’s tender mouth. So go ahead and play catch, fetch, and tug-o-war with your dog. They’ll love their tuff toys and you will have hours of fun playing together. As an added bonus, these unique toys are all machine washable and they float! Tuffy toys have been extensively tested to ensure the highest quality and most fun for your best (four-legged) friends and the best value for two-legged pet lovers. Tuffy are so confident in their durability that they offer a 30-day play guarantee on their toys (T&C’s apply).